Ecologist Hamish Kendall and his commercial RPAS. Photo: John Borren. You will hear it before you see it, like a pesky little fly zooming in and out of the scenery. Lightweight and fast, this flying machine can do extraordinary things with the right attachments. But calling it a drone is a big no-no in the model aircraft industry. Their official name is Remote Piloted Aerial Systems. The term “drone” is something which came out of Star Wars, named after the noise the ships make while vibrating through the sky, and it has become popularised by media. RPAS flyer Graeme Hull says New Zealand has only just tapped into the bare minimum of what this extraordinary technology can do. “Drones are always the things that get the high publicity, but it’s what they carry that makes the difference,” says Graeme. He has a RPAS business in horticulture and agriculture industries, and flies multi-spectral cameras over kiwifruit canopies to look at plant vigour and over farmland to inspect soil erosion. “I was first involved when I was doing my master’s thesis, which involved looking at canopy variability in kiwifruit,” he explains. He says overseas remote-sensing is used quite widely for wheat and corn, but in New Zealand we are only just starting to understand how it might be applied to different crops. Remote-sensing attachments allow you to scan an object and find out information about it both quickly and effectively. With the right sensors, crops can be scanned for diseases from 100 metres away or even from satellites. “What I’m doing is still pre-commercial, and it’s very much around researching the technical feasibility of using some of this technology,” says Graeme. “We need to be sure of the quality of the data it is producing. Ecologist Hamish Kendall says they use aerial drones for his commercial business to map and monitor land and spray weed and vegetation for agencies, such as regional councils and park conservationists. From RPAS’ they can get high-resolution, orthorectified imagery of landscapes, 3D models and specific waypoints. A lot of their work also involves pin-pointing biosecurity issues, such as hazardous weeds. To collect this information, Hamish says they fly in a grid, similar to Google Earth, over natural features. From there they can see where the weeds are, what the vegetation types are or where the agency could possibly place a boardwalk or fixture. They have also developed a spot spray drone, which sprays hard to reach weeds that can’t be eradicated by other tools. While RPAS’ look like toys, they represent a considerable risk to aviation as well as causing privacy and nuisance issues. 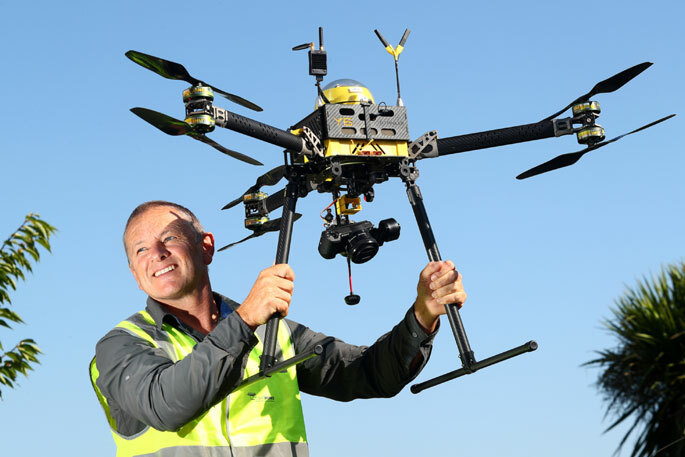 All RPAS’ must be flown within Civil Aviation Rules. These are known as Part 101 and are summarised on CAA and council websites. All commercial operators follow Part 102. Management Accountant - Immediate Start!